Every source I found online says a full installation of Cygwin takes over 1 GB, but mine is only 100 MB. I was pretty sure I downloaded everything from the mirror servers, but the install took less than 5 minutes to complete instead of hours, as I'd expect if it were installing gigabytes of software. Did Cygwin get a huge clean-up during 2012~2013, or did I do something wrong in the installation? A full Cygwin installation can range from 23 to 112 GiB, depending on how you define "full." Your 100 MB number tells me that you just clicked through the defaults presented by Cygwin's setup-*.exe program, selecting no optional packages, because that installs only the Base package set, which currently amounts to 0.1 GiB. Cygwin follows the modern net-connected software distribution model: it assumes you can just run setup-*.exe again and select new packages as you need them. The Cygwin maintainers try to keep the Base category's package set as small as practical.¹ A Cygwin Base install gives you something much like an old-style Unix installation, covering little more than what POSIX specifies. So How Do You Get a Full Installation? ...switch to Category view, then click the "Default" text to the right of the "All" group header. It will change to "Install," as will the corresponding text in all of the groups underneath it. This marks everything for installation. I include this tip for completeness only. You do not want to do this! It will install gigs and gigs of stuff you will never use. Currently, there are 11242 packages in Cygwin,³ and installing every last one of them took 93 GiB of disk space for the installation tree plus 19 GiB for the download tree⁴ the last time I tried it. That gives the 112 GiB upper limit above. All that unused software carries several costs. Even if disk space, download time, installation time, rebasing time, and local bandwidth use are of no consequence to you, consider the generous free mirror's wasted bandwidth. I've done the experiment, so now you don't have to. Skip all of the -debuginfo packages. Few people need these, and they take up a lot of space. 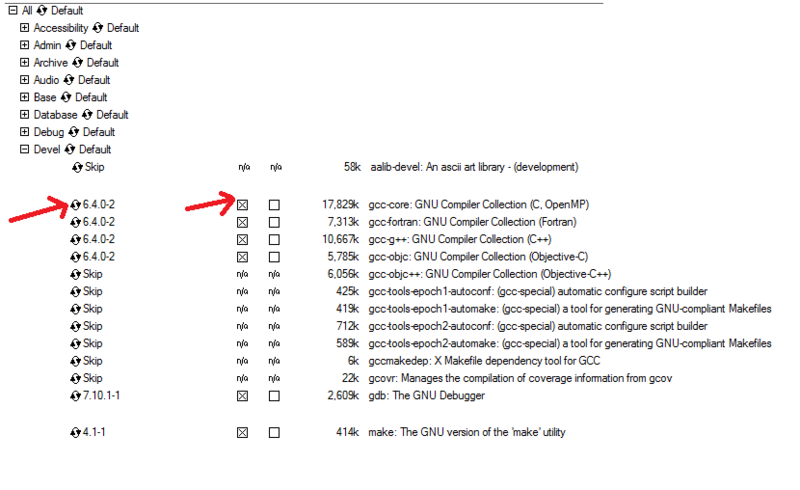 Savings: about 53 GiB in the installation tree alone; more in the download tree. It's easy to apply this rule. After selecting all packages for installation with the sneaky trick above but before you move on to the next screen, click the "Install" text next to the "Debug" category header until it switches back to "Default." If you've already installed the debug packages, click that text until it says "Uninstall" instead. To apply this rule, switch the "Libs" category to "Default" or "Uninstall" as you did with the "Debug" category. The installer will figure out which libraries you actually need in a later step. There are two major sets of cross-development tools in Cygwin: the set for creating Cygwin executables of the other word size (i.e. 64-bit tools and libraries for 32-bit Cygwin, or vice versa) and the set for building MinGW executables of the same word size as your Cygwin installation. 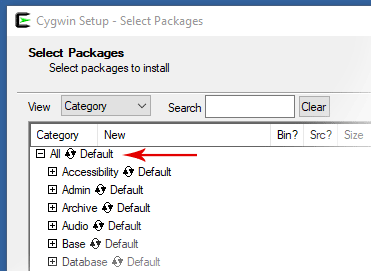 To apply this rule for a 64-bit Cygwin installation, while still on the "Select Packages" screen, type cygwin32- in the package name search box at the top of that screen, then click the Default text next to each top-level category until it cycles to Default or Uninstall, as above. The idea is the same for 32-bit Cygwin, except that you search for and exclude packages with cygwin64- and mingw32- in their names instead. By following this rule set, I was able to install nearly everything, taking only about 23 GiB. A Cygwin Base + Devel installation comes to about 10 GiB. A Cygwin Base + TeX category installation takes about 5 GiB. If you install only your native language's support package, it comes to about 3.7 GiB instead. All of the -doc packages combined chew up about 5 GiB of disk space. If you use Cygwin the way it is intended to be used, installing the base and only the extra packages you need at the moment, you probably won't even get your installation size to even those levels. I use Cygwin this way, and my installations are typically well under 1 GiB, yet they are "complete" by my lights, since they meet my current needs. Doing so is not pointless. It is a viable alternative to using cross-compilers, for one thing. For another, the fundamental incompatibility of the two Cygwins means you may have need of both. There are occasional threads on the Cygwin mailing list where someone argues that some very common package should be included in the Base category, such as Perl, and the result is usually that the maintainers decide not to add it to Base. There could be a vision-impaired Czech immigrant musician who completes US government software development contracts on the side while not busy brushing up on his technical Hindi vocabulary by translating electrical engineering reports into his adopted Mandarin. I want to meet him. He sounds like an interesting guy. Plus, I think I can help him with his plan to create a Tcl/Tk GUI front end for Orpie. Naturally, I will try to talk him into porting it from Ocaml to C++/Qt. I mean, Tcl/Tk, seriously? In 2018? Let's not be ridiculous. Cygwin's setup-*.exe doesn't delete the downloaded package files after installing them. This is useful at sites where you have multiple Cygwin installations, since you can put the download directory on a shared network drive. Each package then only has to be downloaded once at that site. My 105 GiB upper limit assumes you will download and install to the same drive, and that you will keep the download tree in case you need to reinstall it later. All data storage values given in this answer are apparent disk usage numbers — du -bhs — rather than actual disk usage numbers, which would account for the file system overhead, since that varies between systems. This affects the installation tree to a much greater degree than it does the download tree since the proportion of small files is much greater in the installation tree. Expect something like +1% in the download tree and +5% in the installation tree. Pretty much the only people who need the Cygwin cross-compilers are the people maintaining Cygwin packages, since maintainers are expected to build for both 32-bit and 64-bit Cygwin unless there is a good reason not to. There are probably more people with a good justification for MinGW cross-development tools, but there's also the option of using MinGW and MSYS instead of Cygwin. Also, I am guessing that the number of people who do dual-stack Cygwin + MinGW development is smaller than the set of people who use one or the other exclusively, or nearly so. The first pass is to exclude the X11, GNOME, KDE, LXDE, MATE, Xfce, and Games categories using the same Categories view technique as above. Then, using the search box as we did for the cross-compiler exclusion above, remove packages matching gtk, gnome, qt, and kde, optionally excluding those in the Devel, Debug or Libs packages, if you need those. Finally, you'll have to switch to the Pending view and manually exclude a bunch of packages that weren't caught by either of those two broad exclusions: Abiword, Calligra, Celestia, Dia, Evince, Geany, gEdit, Geomview, Gimp, gLabels, GnuCash, Gnumeric, Kalzium, KMyMoney, KolourPaint, Konqueror, Krita, KStars, LyX, Marble, Pidgin, QupZilla, Scribus, Skrooge, Spectacle, Stellarium, Tellico, and Vinagre. If you don't exclude these, they'll drag back in much of what you excluded above as dependencies! You may notice that the size of all the excluded package sets adds up to more than the 23 GiB of the "intelligent complete" installation. This is because of shared dependencies. That is to say, these sizes overlap to some extent. If you put both setup-*.exe programs in the same directory, they will share the download tree so that all of the noarch packages are downloaded only once for both Cygwins. Between that and the fact that 32-bit and 64-bit Intel compilers generate code that differs in size, installing both Cygwins doesn't quite double the disk space requirement. I would like to add to this thread. This approach gives you a leaner, meaner, bare-bones, minimal Cygwin install, with just the tools/items you need. No dependency bloat, no unwanted packages, files etc. I have been experimenting with Cygwin attempting to get a "bare-bones", minimal install. I do find that installing utilities like grep, gawk, sed and similar tools has dependencies on cygwin, base-Cygwin and sometimes unwanted tools like bash, coreutils etc. I wanted to get only the tools and their required dlls installed and started examining the Cygwin package. I discovered that not using the setup.exe supplied by Cygwin is an alternative way to accomplish minimal Cygwin installs. Download only the packages you want from any of the Cygwin mirror sites using ftp or http. Alternatively you can use the setup.exe supplied by Cygwin to download all the packages - download only and no install. Once the download is successfully completed, individual packages like zlib, gawk, grep, libiconv are found under the x86/release or x86_64/release directory Each package is 'tar'red and compressed using tool 'xz' or bzip and stored in respective directories. Find the dependencies for gawk, you can do this in a couple of ways. Examine the Cygwin setup.ini file found in x86 or x86_64 folder. Look for the string '@ gawk' and in the lines after this line you should find a "requires:" line that lists the dependencies. Mine reads like this - "requires: bash cygwin libgmp10 libintl8 libmpfr4 libreadline7"
For gawk to run, bash is not a must since we have the windows command shell. (bash is included to get a few other dlls required by gawk. However, that causes a lot more unecessary files to be installed.) The other dependencies contain files that gawk needs to run. Extract each of the above packages using tools like 7z or xz into individual files. You should now be able to run your tool with the minimum set of .dlls required in a bare-bones cygwin installation. Caution : It may not be sufficient to just extract the dependencies listed in setup.ini for each tool. Sometimes, you may need to execute/run the tool to discover that there are more dlls required. Consult - How do I detect the DLLs required by an application? How do I find out which dlls an executable will load? I also brute forced this dll info by just running the tool and installing the missing dlls listed one by one by extracting from the required packages. When you run a tool and it errors out with a missing .dll message, search for the package that contains the dll here - https://cygwin.com/cgi-bin2/package-grep.cgi . Enter the full/partial name of the missing dll to find the name of the package containing the dll. Eventually, I have ended up with a bare-bones cygwin install with only the tools and dlls that I need. Hope this is found useful. The Cywin installer also does dll re-basing, which I will not venture into here. Not the answer you're looking for? Browse other questions tagged windows cygwin diskspace or ask your own question. Where can I download an offline installer of Cygwin? How do I find out which dlls an executable will load? How do I detect the DLLs required by an application? What does rebaseall in Cygwin do? Which of the cygwin mirror sites is complete? How do I install cURL on cygwin? Cygwin setup (32bit or 64bit) works with the same mirror packages?